Hello Friends, And Hello Weekend! Today is also World Card Making Day! Woohoo….like I need an excuse to make a card. LOL In honor of this day I am going to try and sneak sometime in to do just that! Are you up for the Challenge? I sure hope so! I can’t think of a better hobby, that I do, that brings me such joy and satisfaction, and can bring joy to others as well! I am so glad I found this niche many, many years ago! What would you do if you weren’t a card maker? I would love to know! 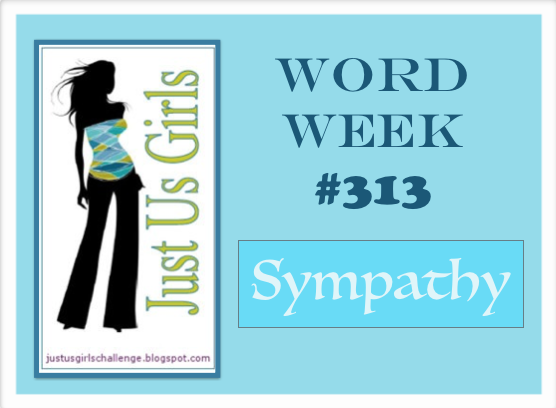 Today over at Just Us Girls it’s word week, and our word is Sympathy! Unfortunately you always need to have a few of these types of cards laying around, and the older you get the more you need them. I also would like to welcome our newest JUGS Guest Designer with us for the month of October and her name is Julie Gearinger! Welcome Julie! Here are a few of my card details: I made this card a while ago and can’t quite remember exactly what or who suggested this technique or if I can explain it, but I will try. The idea is to combine to patterns together that wouldn’t quite seem to go together to make a background. So I decided after I used a sponge dauber to make my circle background, I would heat emboss some SU leaves over top. I actually think It turned out rather cool. The flowers are from Stampin UP and heat embossed on vellum and layered over an exact shaped flower punched out from craft paper. I love that effect! Added some tan lace, a Verve sentiment and some MS punched out leaves. Categories: Cards | Tags: Card making, Cards, rubber stamps, stamping, Stamping Up, Sympathy card, Verve Stamps | Permalink. I am right there with you…hence the name of my blog. I use to love to scrapbook all the time, now I am so far behind and still have good intentions, but cards are so much faster and I am not very good at scrapbooking now…to much space! LOL Have a great day! Beautiful card. Love the background you made and of course the flowers. Have a great weekend. Wow, what a gorgeous card! Love the background you made (gotta try that!) and the flowers are beautiful! I love the card you created. Gorgeous! And, if I were not a card maker I might have done more crocheting and reading. Now I forgot how to crochet as it has been so long. LOL And, if time permits I will try to do at least one card today. You have fun making cards too! Gorgeous card!! Love the soft green and lovely vellum flowers! You are to sweet Angie! I appreciate this wonderful hobby of ours too and all the people it has brought into my life! Have a wonderful day! HUGS! This is stunning! I am going to have to try your background technique. I love the look of it and those vellum flowers are beautiful! i really like the addition of the lace too. Beautiful card! This is stunning! Your background is gorgeous and so clever and the vellum flowers are so soft and pretty. Oh, I love the colors on this card aling with all of the fabulous details!! So thrilled to be Guest Designing with you this month- hugs and have a great week! Nancy, this is such a beautiful and comforting card! I love everything about this, the vellum flowers, the lace and that beautiful, soft muted background.